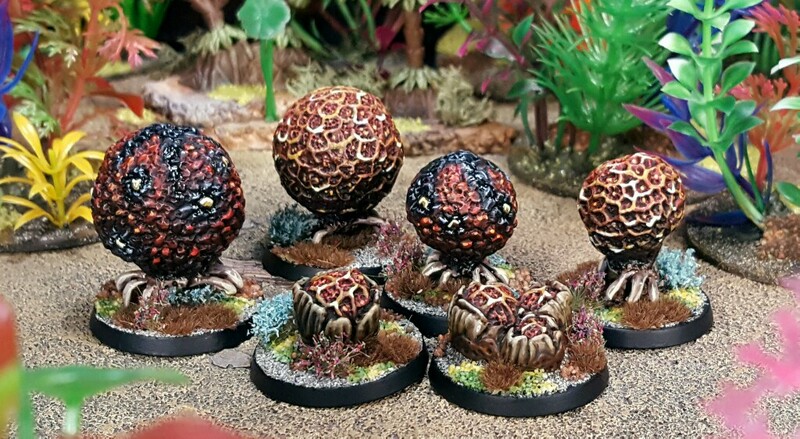 Knowing my enthusiasm for all sorts of 28mm alien wildlife, the proprietor of Krakon Games sent me a preview of some odd, bladder like Cirripod aliens. I rapidly painted the chunky, heavily textured models with slight nods to alien in the old John Carpenter “Dark Star” movie. I turned them around fast and they are now ready to perform various roles in my upcoming games. Space balls? Oh ****, there goes the planet. I’ll admit to being tempted by these exact creatures, despite my lead pile and thin hobby budget. Im conflicted NSA, should I attempt to lead you astray, to spend money that you should perhaps not? Hell yeah, I want to see your balls in the flesh please. I also want to have a play with my own when Frills & Fauna delivers. Im planning a ball fondling extravaganza when the postman arrives in a few weeks. Looking sharp – time to look at the dangerous plants section of the RT bestiary. Are you based in Dublin by the way? The Cirripods are very suited for use as “Bouncers” from the RT book CK. It was a treat to get the Cirripods early yes. Im sure that you will enjoy painting them Alex, fun little things to fire paint at. A nice addition to the deathworld flora.Though they look a bit fauna too though. Thank you Mr Saturday. They are the sort of models that I reckon you might approach painting entirely differently to me and still find it enjoyable. Having a couple of Deathworld hazards is a bit like only having access to two miniature buildings: they become boring very fast. Adding more units like this give a larger pool to draw from, with correspondingly more interest and variety transferring to games. And they are always fun little projects. I’m glad that you like them Mark! At least I’m gonna pretend I’m embarrased for liking your balls! Seriously, I do love how they look when painted. I was trying to resist this KS, you’re not making it easy!! Its a fun Kickstarter Suber. I dont want to lead you astray or anything, but its right up your street I think. Very nice balls indeed. Nicely textured and,surely morw teeth and eyes inside… I really like this Kicksrarter. I never found the plastic plant offerings in the dollar store alien enough. The addition of a few more obviously alien bits and pieces can dress aquarium plants in a more exotic way. I tend to aim for a Star Trek (original series) style patches-of-sand-surrounded-by-plain-bushes-with-occasional-lurid-alien-elements approach. The Ramshackle Games mutant plants (also visible on this blog) are excellent for that too. Can’t believe I missed these comments and the oh so subtle innuendo 😀 So lovely work on those pitted, hairless balls! I used up all the ball jokes when I made the lo-fi version of these out of table tennis balls and puffy paint last time. You can take a close look at the scary, wrinkled and swollen items in question the next time you visit Mikko. It’s always a special occasion when you plunk them on the table for some late night fun. Interested to see you didn’t go for proper psychedelic colours on these, and chose a more muted pallette. I went with the colour description of the Bouncers in Rogue Trader this time. These models are a good fit for those. The same colour palette also fits the alien from Dark Star, so I figured that I would just go with that.